Supplied: In a 3 litre container of peat-free compost, healthy and well established, approximately 50-70cms (2 feet) high, with full planting and aftercare instructions. In general, it’s best to select trees with multi-season interest, so that at almost any time of the year one would notice some characteristic of beauty or utility. Occasionally, however, one would be forgiven if they preferred a tree that had one truly exceptional season of interest. 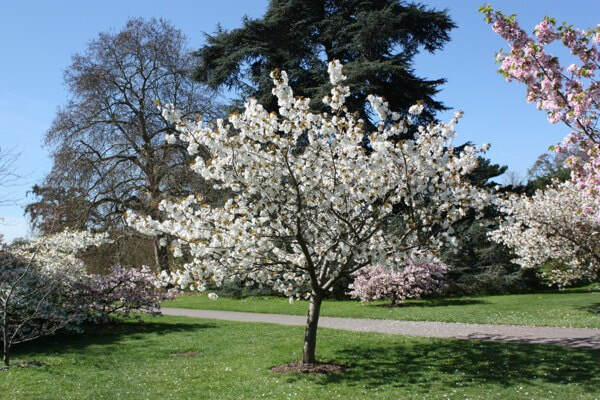 Prunus serrulata 'Tai Haku' or Great White Cherry is one such tree. When in full bloom it is simply glorious. It has the most immaculate, pure white, flowers that are a full 2 inches across, considerably larger than most cherries. The size and profusion of bloom might even be overpowering if it was any color other than white. And they are white, utterly and completely, without even a hint of pink or yellow. This purity of color along with the simplicity of the blossom (no frilly edges or double petals) gives a chasteness to the display. It helps that these blossoms are framed by exceptional foliage, bronze, with serrated edges, which emerge concurrent to the bloom. These leaves turn a bright green for summer and orange and yellow in autumn, which actually provides additional seasonal interest, but it’s the bloom that eclipses all other attributes. 'Tai Haku' grows quickly to reach a mature height of approximately 8-12 meters, with an open vase or-spreading shape. It likes a sunny or slightly shaded position, with shelter from the harshest of winter winds and while suitable for most garden soils will not tolerate water-logged conditions.